If there was one product type we thought wouldn't be a problem, it was baby play mats, or what are also called baby gyms. How wrong we were again! These "gyms" are just colorful, square or rectangular mats with various toys dangling above on soft cross bars. The idea is to entertain a small infant while on his or her back on the floor. As of 2008, some of the most popular baby play mats and baby gyms, are oblong, or "tunnel" shaped, and there's the problem. Babies often aren't comfortable with the stimulation of things dangling over them until around 11 weeks. With a tall baby or a long baby, by the time you place them comfortably on the mat, (which can be after 11 weeks), they are too big to move freely in the oblong styles! This isn't to say your 11 or 12-week old is going to be flipping from tummy to back repeatedly, but ours certainly liked to turn one way on his mat. But exactly one week after being old enough to use it, he was so big, that simply turning to the side would have his head, arms or legs bashing into the plastic side mounts. Instead of a play mat, it was a little baby prison. 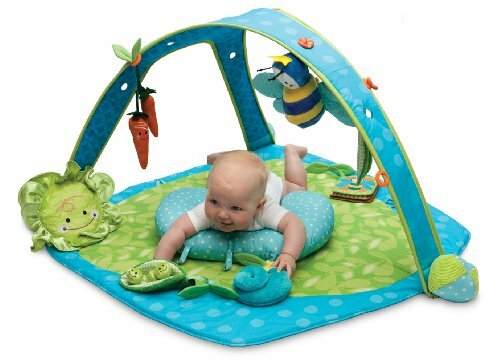 The biggest play mats and baby gyms are actually the round or square styles, such as either of the Baby Einstein Activity Gyms. Look for those shapes, because you'll want the extra room. Avoid the tubes, tunnels, leaves, surfboard and other oblong shapes. Technically, the most room possible is found in the Boppy EntertainMe Play Gym, Garden Patch style , because it's large, square, and the base of it's cross bars sit outside the mat area. There will be many babies who enjoy a play mat sooner than 11 weeks of course, but for the longest use, get the biggest surface area. It should be re-stated, we're not talking about a "big" or "hefty" baby here, just a tall one! A truly long and lean baby also winds up bigger at the shoulders and legs, and frustrated in these narrow baby gyms. Choose wisely! And on the inexpensive end is the Infantino. This one has the right design for a bigger or longer baby, and it collapses for portability. This alternative is also very spacious, but it's significantly more expensive. We thought the compromise to the Boppy version was priced right for what you get. But if you want something extremely interactive, with even more bells and whistles, this one comes highly rated.